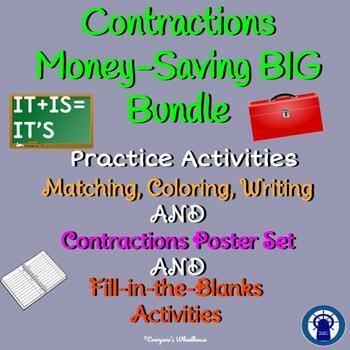 Save money with this big bundle of products for teaching and practicing contractions. Please click on the individual products for previews. This set of four no-prep contraction practice activities will allow your students to reinforce their learning of contractions. 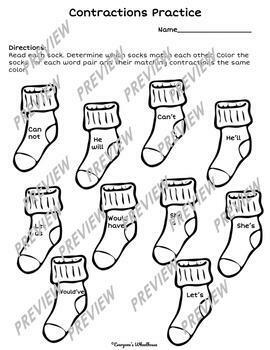 Two matching and coloring activities are included, as well as two activities with written practice. 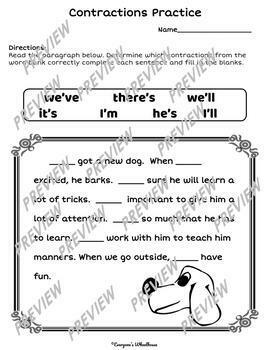 Showcase your students' knowledge of contractions with these engaging exercises. This set of contractions posters makes teaching and learning contractions a snap. With descriptions, examples, and explanations, these tools are excellent for displaying in the classroom or adding to writers' notebooks as reminders for students. These posters are colorful and easy to follow, simply print and put to use today! 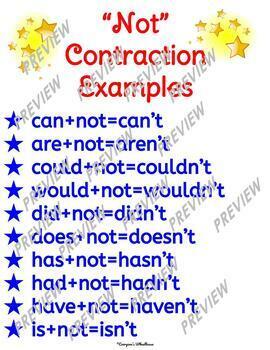 Examples of "not," "have," "will," "are," and "is" contractions are included.